to run your time-based dash. Plan your dash based on whatever works best for both your project and the particular block that's hanging you up. The key is to pick a goal that's laughably modest. Seriously, this is not the place for extravagant predictions and overly ambitious goals (that's probably what helped land you here, right?). 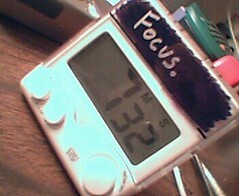 Time-based dash - Most jobs lend themselves to a time-based dash, so pick up a kitchen timer at your local drugstore. Choose an amount of time that gives you enough room to do something but that's brief enough to seem completely unintimidating. For some reason, eight minutes seems to work well for most of my own dashes. Unit-based dash - Alternatively, depending on the tasks you've been avoiding, you could go with a unit-based dash, during which you agree to plow through an arbitrary number of pieces associated with your project (such as pages to read, words to write, glasses to wash, etc.). Combination dash - In many cases, the best solution is a combination dash, in which you get to stop the hated work whenever you reach either the time or unit goal first. Above all, remember that this is all about doing something, so pick a goal at which you can't possibly fail. Here are a few ideas to get you started, although dashes can work for virtually any project you've procrastinated--no matter how monolithic. Messy garage - Goal: 10 minutes or 1 full garbage bag. Spend 10 minutes working in one area of the garage. Take out old papers, break down some boxes, or move the Christmas ornaments to the top shelf. When the timer buzzes at you, stop. College application - Goal: 5 minutes or 1 page. Start by filling in the easy boxes. If you reach the bottom of the page before time is up, stop. Overdue report - Goal: 10 minutes or 100 words. Just start writing, even if it's complete crap. Just keep scribbling for 10 minutes or until you have a paragraph or two. When time's up, stop. Holiday cards and family correspondence - Goal: 5 minutes or 2 notes. Grab a pen and start making with the nice. Tell them about Tyler's big day at Computer Camp. Brag about Ashley-Marie's jazz and tap recital. When you've hit two finished cards, stop. Feel Like Working More? Well, do ya, punk? Once you've made any progress on something you've been procrastinating--even the ridiculously minor amounts of progress you make in your dash--you might find it irresistible to keep working at it. That's okay. Seriously, go nuts. Although you must begin your dash with the confidence that your life preserver is never more than a few minutes or units away, there's nothing to stop you from paddling forward if you're making happy progress. That's the trick, and, believe it or not, it totally works. Give it 8 minutes, and find out for yourself. Submitted by J|RSHAW (not verified) on September 8, 2005 - 2:25pm. "To my mind, this has become that very rare thing, a perfect app. It has only one aim: to be a short-term timer, but it has that function covered from all angles, and achieves it in the most elegant way imaginable. It can be controlled from keyboard and/or mouse, it can count up down or sideways, but remains simple to look at and to use. And it is free! I can really think of no reason not to have this on your Mac. Nick Sloan - VersionTracker"